Shrimp, flour, egg, kinchay (cilantro), chopped onion, salt and pepper to taste, oil for frying. You can add in veggies like carrots and malunggay. Mixed all the ingredients in a bowl (except the oil), scoop a tablespoon and form the mixture into small balls (bite size) and deep fry. For sauce: mix vinegar with soy sauce, crushed garlic and chili, a dash of pepper and sugar. You may also use catsup or sweet chili sauce. Best served with cooked rice. 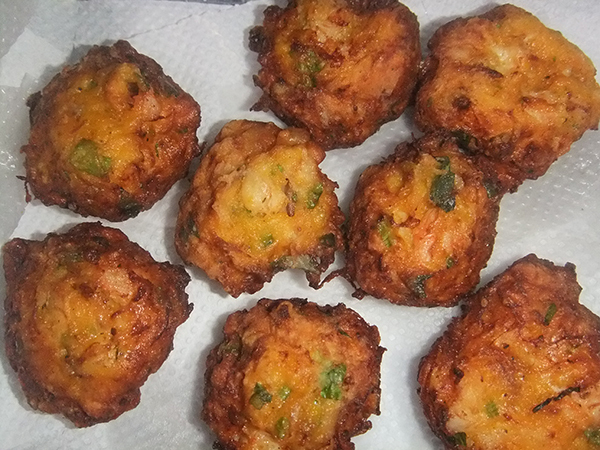 This entry was posted in Favorite Food, Healthy Snacks, Recipe, Sea Food and tagged crunchy shrimp balls, shrimp balls, shrimp recipe on March 9, 2014 by Yami.